I think it is fair to say, that right now, I am essentially lost in a world of science fiction novels. That when it comes time to pick the next book to read I’m drifting firmly through the futuristic worlds of space. Whether it’s with the Games Workshop created, war-torn dystopia of the Necromunda Underhive, or their infamous Space Marines, I am not spending much time on planet Earth right now. Don’t get me wrong, there are times when I just reach saturation of all things space and need to feel the pull of gravity, again as it were – hence the curve ball of indulging in The Angry Chef’s debunking of fad diets and pseudoscience in the middle of this alien adventure – but, with my satiety once again in need of satisfying, I was back blasting off into the stars – this time, however, I was leaving the grim darkness of the Warhammer future behind and instead, entering the galaxy as imagined by Becky Chambers. I came across Chambers purely because Google’s, unimaginative algorithm, saw I’ve been reading a lot of sci-fi and suggested I read some more! Not something you really need to ask me twice about at the moment, especially when the suggested book is only £2.99! Not knowing anything about The Long Way To A Small Angry Planet, I was pleasantly surprised to find that it’s a rather simple space opera. In my view, the cover of the ebook would lead to you expect a dreamy, expansive wanderlust tale, so to find a character-driven story was both unexpected and enjoyable. This unexpected reality, however, did create a problem. A story of a single crew, existing within the confines of their ship, flying through space and getting into scrapes along the way. It’s hardly an original idea and, even in the timeless voids of space, science can only be reinvented in so many ways. This unoriginality in the basic set up of the book meant that, sadly, it was quickly invoking memories of the TV series Firefly and James S. A. Corey’s Expanse novels into my mind. That’s not to say there is any hint of plagiarism, it’s just that I would find myself drawing parallels between the personalities of a character anew, with a character of old. Comparisons which were not enough to make me hate the book, but enough to stop me being able to shake the feeling that I was just reading someone else’s extension to an existing world, rather than stepping into a whole new environment. 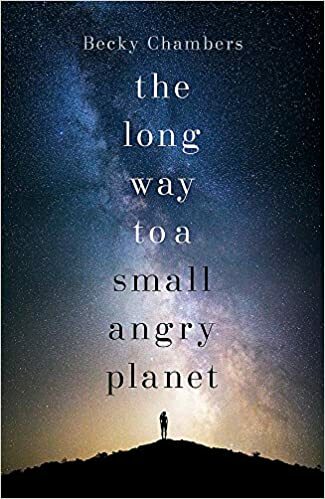 Whatever references my mind occasionally made ‘A Long Way To A Small Angry Planet’ is not a heavy or hard book to read. It’s very much of a Young Adult flavour and Chambers’s writing style is both light and fluid. The simplicity of her language creates a rhythm to the journey it takes you on, meaning I never felt I was having to force through sections. Never once did I feel I’d stopped, stuck having to actively think about the story I was reading, or attempt to bring a picture into focus. I could just flow through the narrative, as the characters take you on their journey, from Chapter to Chapter. Sadly though, even with a style of language, which while adolescent in style, brings the characters to life in a way that draws you in and makes you want to befriend them, the book has some issues. To start I found that, too often, the book would go out of its way being overly moral, ethical and preachy. I felt like Chambers actually wanted to write a social commentary. To point out all the ways society excludes, prejudices and segregates people because of every little difference, opinion, or choice. The book felt like it was just a soapbox from which she could camouflage her opinions and while there is nothing wrong with using a platform, to point out the issues and to show right from wrong, Chambers just walks on eggshells when doing so. Everything she highlights is positive. If she goes near to touching a negative stance, she can’t let it sit without pointing out how wrong it is, or making an apology on its behalf. The more I read, the more this approach started to grate. The world isn’t all sunshine and flowers, you need balance, you need to have the rude, obnoxious idiot in the corner drunkenly spouting off. The man swearing on live TV. We all know it’s wrong, but we don’t need people to constantly apologise for the fact the world isn’t perfect. I also struggled to accurately picture the characters. Chambers diversified them more and more, reaching the point where I just couldn’t keep up with the relevant number of limbs, scales and feathers on offer. My mind reverting back to the simplest human form. Everything becoming bipedal, with two arms and a mouth. This simplification meant that when Chambers spent time detailing something “species-specific” I would mentally detach as it seemed no longer important. The character in my mind no longer matching the words on the page. It’s not all doom and gloom though, because, if you stop trying to delve too deeply, and selectively zone out it’s idealistic preaching, taking it purely as a surface-deep space tale, it’s actually good fun. The personalities of each character manage to hold it together, and while the setup is unoriginal, the plot isn’t. It’s a plausible and interesting scenario, that carries the right mix of twists and turns, danger and suspense to keep it feeling fresh, and more importantly, engrossing. I feel like I shouldn’t say that, having implied that it’s all a bit commonplace and trying to hide a deeper message, but I have to because, whatever its faults, it kept me entertained. Even now, having only just finished it, I already think back to it fondly. So fondly in fact, that I wouldn’t rule out reading it’s follow up ‘A Closed And Common Orbit’ sooner rather than later.